Adult College Spring Term Begins! Orientation Day is an opportunity for newcomers to be introduced to faculty and staff members. It is also a great opportunity to network with other new students. CW welcomed our evening students during the Adult College Spring Term II Student Orientation. 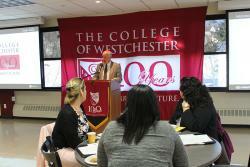 Students were greeted by Dr. Warren Rosenberg, Provost and Vice President of Academic Affairs. “This orientation is offered to help get you started on your path to success,” said Dr. Rosenberg. 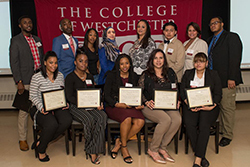 White Plains, NY – The College of Westchester Charitable Foundation (CWCF) hosted its 10th Annual Scholarship Fundraiser, honoring 13 scholarship recipients.